Love is in the air, can you feel it? I’d be lying if I didn’t say I mostly feel the -20 degrees and the snow blowing in my face first, but as February quickly approaches the little red cinnamon hearts will call my name and I’ll be set for Valentines Day! 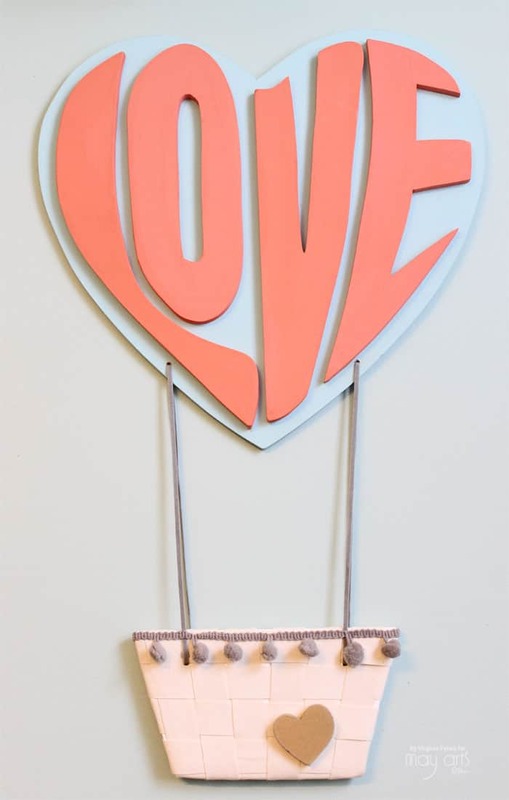 Today the May Arts Ribbon Design Team has got together loads of Valentine’s Day ideas to get you in the mood! I made this sweet Love Hot Air Balloon Decoration, in place of a traditional wreath this year (However, the other door is sporting last years Valentine Pom Pom wreath). I got the idea from a Valentines Printable I found on The Creative Paige, it was just so cute I couldn’t resist! Since I got a new Ryobi Jig Saw just before Christmas, I’ve became totally addicted to sawing up everything in sight! 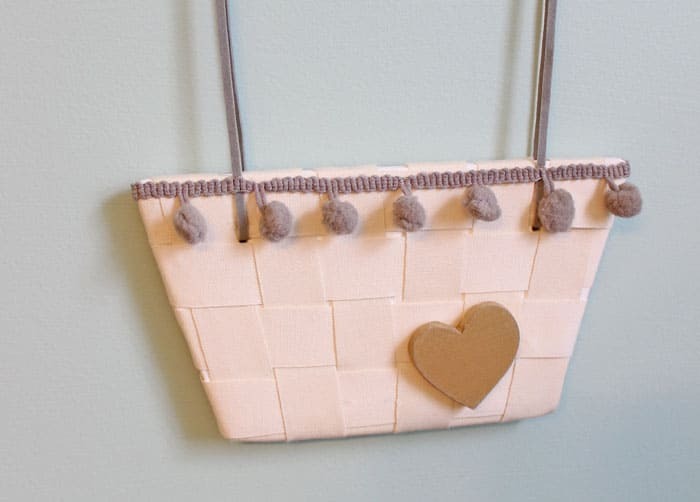 I cut the love balloon and basket from 1/4″ hardboard, and drilled small holes in each for the May Arts Ribbon 1/8″ Grey Faux Suede to attach the pieces together. For the little basket, I weaved together strips of May Arts Ribbon 5/8″ Ivory Canvas and hot glued the edges to the back side. The top edge of the basket is trimmed with May Arts Ribbon Large Grey Pom Poms. 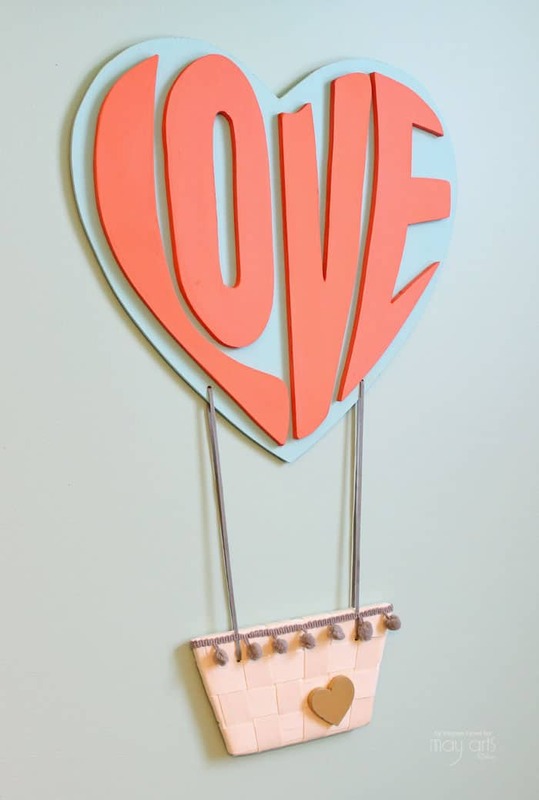 This little hot air balloon decoration is perfect for Valentine’s Day… wouldn’t it be sweet in a nursery too?! 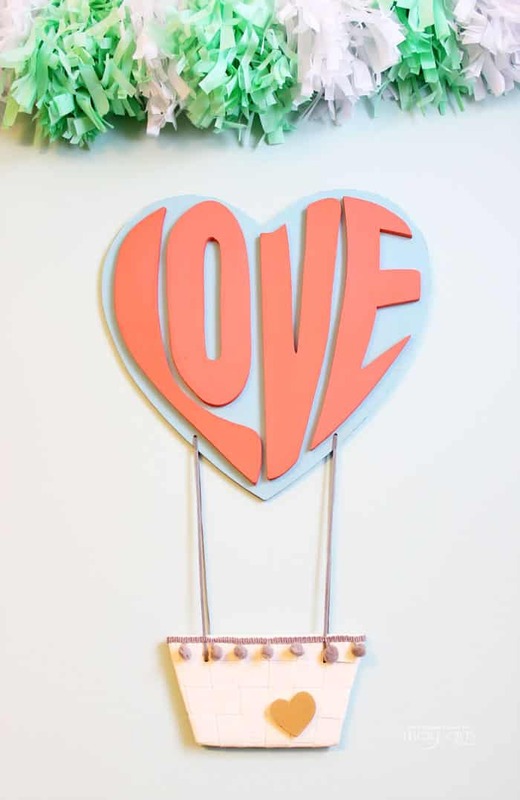 Be sure to visit the other ribbonistas for more Valentine’s Day inspiration! Leave a comment here, and on the May Arts Blog for a chance to WIN 2 spools of May Arts Designer ribbon! Don’t Forget to enter for your Chance to WIN one of 4 FUJIFILM INSTAX Mini 8 Cameras! Such a cute little camera – love the pink color. Forgot to say that your hot air balloon decoration is so cute. Love the hot air balloon, great use of the ribbon, thanks for the inspiration. This is just over the top adorable! I love it! This ballon is so lovely and pretty! I’ve never seen anything like this before! How adorable! Wow – very clever idea! Love it. I love this hot air balloon. I’m going to make one for my craft room. How fun is this project, Would be perfect for my grand daughter. Gorgeous project! And I LOVE that pom-pom ribbon! Super cute hot air balloon design. I love the basketweave design on the front, cool. Thanks for sharing. FUN, FABULOUS and SERIOUSLY AWESOME project Virginia!!! Sounds like your jigsaw is a SUPER COOL too and LOVE how it INSPIRED you to CREATE your balloon FILLED WITH LOVE and your PRETTY woven basket, finished off perfectly with the pom pom trim!! !